Physical modifications: Filed off mould lines, filled screw wells in thighs. Filling in the joints in my other Joe scale models is time-consuming and rather irritating, so I got lazy and skipped that step on this figure. It was more fun to work on, but the finished product is ultimately less satisfying. 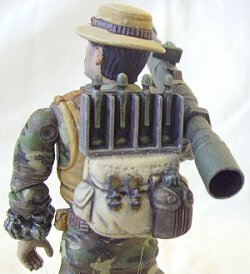 For the bazooka I added a bit of aluminium tube to either end so the barrels would actually look hollow. This effectively lengthened the weapon, making it that much more intimidating. 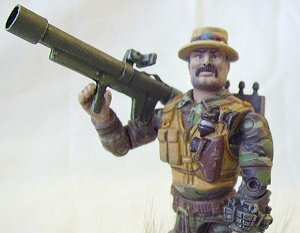 Painting: Thought I’d try the standard U.S. camo pattern. The face turned out great, but I’m most pleased with the fishing vest. For the first time I did a wash and drybrushing rather than painting in the shadows and highlights one by one. The effect was perfect, although it probably wouldn’t work everywhere. 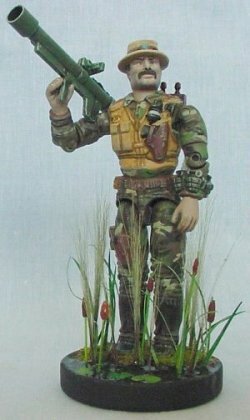 I think it proves, though, that scale modelling techniques will work on any custom figure. Give it a try! Groundwork: It was fun to squeeze all those recognisable attributes of a marshy area onto a tiny base. 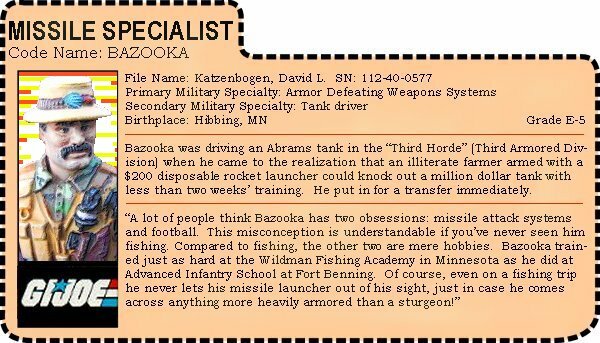 I love how the groundwork depicts Bazooka’s environment while the wicked-looking eponymous weapon bluntly conveys his purpose. 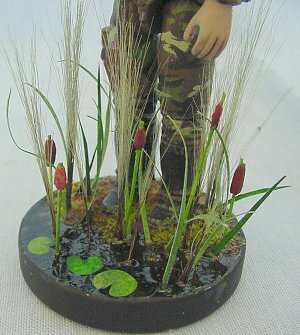 The vegetation is a mix of scale model supplies and household items; for example, the cattails are styrene rod (available at any hobby shop) dipped in candle wax.